Superbly located in the heart of downtown Toronto and close to the city’s top attractions. Settle into recently refreshed guest rooms and suites and experience 4-star amenities like an on-site spa, several delicious restaurants, a full fitness center with a state-of-the-art indoor-outdoor pool. 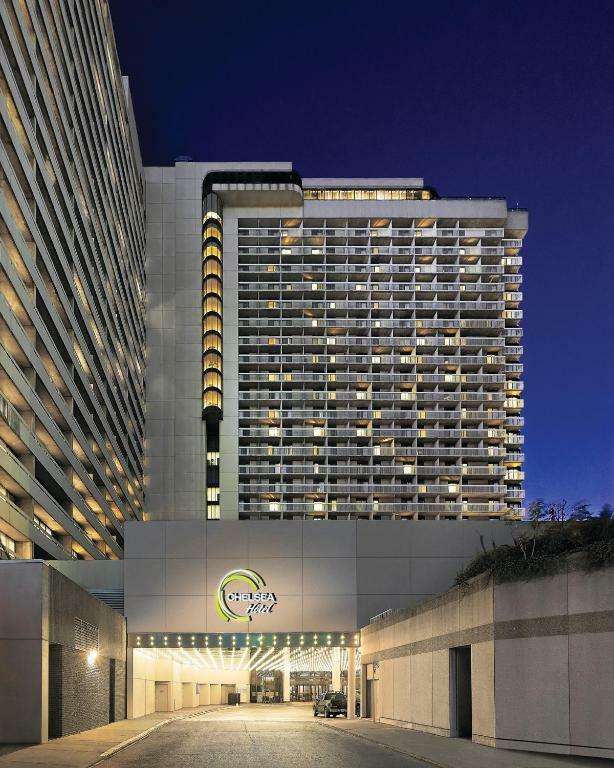 The best of downtown Toronto is at your fingertips here – the hotel is conveniently connected to entertainment districts by way of the PATH, a 16 mile underground network of shops and services. Within 350 yards of College Subway Station, this hotel features on-site dining, a fitness centre and 2 indoor pools. The Toronto Eaton Centre is 650 yards away. Dining options include the Market Garden restaurant and T| Bar Lounge. Guests can sip on a coffee or cocktail at the expresso coffee and wine bar. Room service is available. At the Chelsea Hotel Toronto guests can relax in the sauna or hot tub. Chelsea Hotel Toronto is 10 minutes’ walk from the Art Gallery of Ontario. Toronto’s entertainment district is 15 minutes’ walk away. The Westin Harbour Castle, Toronto hotel on the revitalized waterfront, just steps away from the Downtown Core via the PATH, Toronto’s underground covered walkway. The city’s lively theatre and entertainment districts are just steps away, as are the Air Canada Centre and other famous attractions. Some hotel rooms also boast incredible views of Lake Ontario. Stop by one of several outstanding restaurants for a delicious, healthful meal – or refresh with a dip in our indoor pool. The hotels prime waterfront location enables you to explore the best of the downtown area with ease – from Rogers Centre to the CN Tower and Ripley’s Aquarium. The Strathcona hotel boasts 194 guest rooms, a vintage pub, and the York Street Cafe & a few short steps from connecting you to anywhere you want to go. Situated in downtown Toronto, The Strathcona Hotel conveniently connects to all of the main transportation hubs. Within walking distance, guests will delight in world famous attractions like the CN Tower, Ripley’s Aquarium, Rogers Centre, and more! Find comfort, service, convenience, and a unique atmosphere when you stay at the Bond Hotel. It is conveniently located at the foot of Yonge & Dundas Square. Shop, explore, attend, eat, drink, and experience The 6ix from their central location. Centrally located in the city of Toronto, this hotel is 10 minutes’ walk from the bustling Eaton Centre shopping mall and 2 minutes’ walk from College subway station. It features spacious rooms with free WiFi. The Bistro at the Downtown Toronto Courtyard features snacks, a la carte items, Starbucks coffee and a full cocktail bar. Free access to the 24-hour gym and the indoor lap pool is provided to all guests of the Courtyard Toronto. The business centre and lobby library are also available. The CN Tower and Art Gallery of Ontario are both 1.9 miles from the hotel. The University of Toronto is 10 minutes’ walk from this hotel. This downtown Toronto hotel is 6 minutes’ drive from the CN Tower and Rogers Centre. Free WiFi and a hot continental breakfast are provided. The spacious, contemporary rooms at Holiday Inn Express Toronto Downtown provide cable TV with pay-per-view movies, an arm chair and desk. They also have a coffee maker. Fresh fruit, eggs, bacon and a pancake machine are featured in the daily breakfastA fountain and garden are featured in the courtyard. The hotel offers free newspapers and a business centre with a printer and fax machine. Union Station is 10 minutes’ drive from the Toronto Holiday Inn Express. The Hockey Hall of Fame is 10 minutes’ walk away. 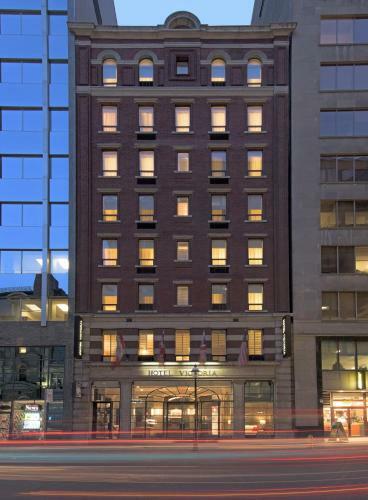 Situated in downtown Toronto, less than 5 minutes’ walk from the financial district, Hotel Victoria offers free WiFi. The Hockey Hall of Fame is 3 minutes’ walk away. All guest rooms are equipped with a 32″ flat-screen TV, custom furniture and attractive hardwood floors. Guest bathrooms include a tub and glass shower stall. Over Easy restaurant, located on site, is open each day for breakfast and lunch. Hotel Victoria is 100 yards from King Subway Station. Billy Bishop Toronto City Airport is 1.9 miles away.